Home » Angel Numbers » Angel Number 7 – Find Out Why It Is Appearing For You? Angel Number 7 – Find Out Why It Is Appearing For You? Angel number 7 is a unique number. We all have a divine purpose, a goal we move closer to every day. Certainly, with every decision and action, this mission can become clearer to us. However, the path is not always obvious. There are many times in our lives where it may feel that we lack direction. It helps to know that there are spiritual guides that are looking after you. As your guardian angel, it is their job to assist you in finding your true life path. They attempt to provide you with guidance and wisdom so that you may live up your potential. Also, they follow you throughout your life. They give clues and impart wisdom with hopes that you might obtain an understanding of your true purpose. What do Angel Numbers mean? Our angels use common numbers as a form of communication. The repetition of a number grabs our attention. The repetition of numbers is the subtle way that angels can send us messages. They are known as angel numbers. For this reason, it is important to have an open mind and be alert to these clues. Notably, Angel Number 7 is an exciting and important message to receive. Reinforcement and encouragement are part of its meaning. If this number appears to you often, then you should feel a sense of pride and comfort. Your angels are proud of the decisions you have made. They feel that you are on the correct path and are capable of fulfilling your divine purpose. What Does Angel Number 7 Mean? If you don’t know what 7 means in angel numbers, don’t worry. 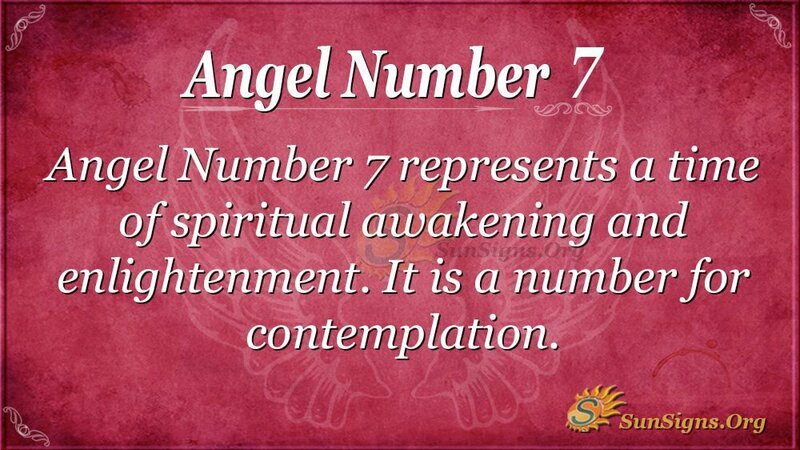 Angel Number 7 is also thought to represent a time of spiritual awakening and enlightenment. This number might be a sign that you are about to have a spiritual revelation that will lead you to your divine goal. In due time, you might find yourself faced with new and exciting opportunities. Do not shy away from them at this time. One of these opportunities might lead you down a great new path. What is the Spiritual Meaning of Angel Number 7? Trusting your instincts and intuition is important. You have been successful in your journey so far, and the spiritual world is showing its support of you. Your angels want you to trust yourself and continue forward with an open mind. Therefore, use your intuition to hone in on your strengths and weaknesses. Now is the ideal time to work on developing your skills. Additionally, grow your connection to the universal energies. By doing so, you will have a clearer image of your path and yourself. Angel Number 7 meaning represents an ideal of sorts where mind, body, and spirit are in alignment with each other. If you focus your attention inward, you will find yourself achieving a new level of inner peace. With a calmer, positive demeanor, positivity will find its way to you more easily. As a result, continue forward and know that your spiritual guides are cheering you on. You are heading in the right direction. You need to keep working hard and follow your intuition. As long as you keep moving ahead and are in tune with the universal energies, your mission will become clear to you in due time. Indeed, our journeys can be perplexing at times. It is easy to feel overwhelmed and lost. However, if you are open to the messages around you, you might find support and encouragement. Moreover, they give you direction to keep moving forward. So, what is unique about the number 7? Well, Angel number 7 is a number for contemplation. Previous Angel Number 6 – Guess The Real Meaning!